Main – The most recent updates and relevant links! About – This is the page to go to if you want to know what the game is about. Characters – Info on the main cast and heroes we have announced so far. Media – Screenshots and videos will pop up here. Forum – You can find a link to our forum on each page. Talk about Panic and stuff. 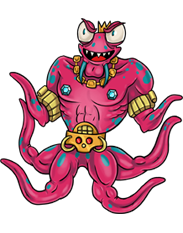 PANIC is still under construction, so if you don’t hear from us for a bit, we’re most likely at our desks making our lovable cast of weirdos beat up monsters and say funny things. Be sure to follow our development here, on social media, and Twitch! Welcome to PANIC base! In 19XX, Earth is attacked by a mysterious force from beyond our dimension! Their message – submit or die! 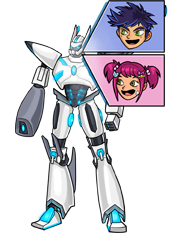 In a last desperate attempt to strike back, the World Defense Force puts their resources into creating the Pandimensional Attack Nexus and Intelligence Command – the dimensional phasing base known as PANIC! 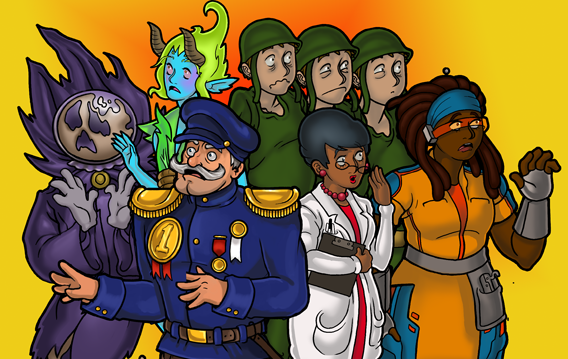 Staffed with Earth’s smartest and bravest, they may be the last hope for our universe, and perhaps every dimension in the Multiverse! And all they have to do is win against incomprehensible odds… wait, what? How is that a plan?! Your mission: collect heroes from all over the Multiverse and bring the fight to the enemy, the self-proclaimed overlord of the Multiverse, King Sha’art! PANIC’s gameplay is a mix of classic JRPGs and a Tug-O-War system. 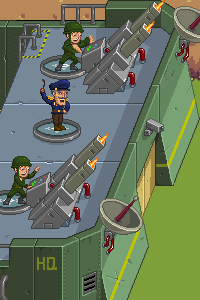 Push forward and take the fight to the enemy bases and bosses before they can destroy your base. Use special attacks and actions to change the tide of battle. Level your heroes to unlock new abilities! Use a combination of over twenty heroes with unique abilities to take down the enemy as fast as you can! But be careful, the enemy will keep sending out more difficult waves until you finally take them down! If you lose all your heroes or your base, PANIC will be forced to warp back to its home dimension. Back at the base, spend resources to buy items, upgrade your base and heroes, turn in Collector bounties, and unlock new universes. Story unfolds as you upgrade heroes and move the campaign forward. 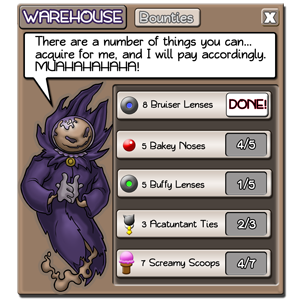 To truly see all of the story, you will need to complete as much of the game as you can! PANIC in the Multiverse! It's everything you always wanted in a game, even if you never knew it. For those ready to play the future of yesterday today, it's time to PANIC! The only one brave or stupid enough to wage war on infinite fronts. 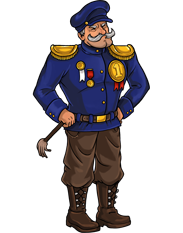 He appears in most cutscenes, but is also in charge of the barracks where you upgrade your base. He seems to meet danger head on and with no fear, much to the absolute dread of his clone army. If anyone could get a medal for sheer gumption, it would be the General… and he has! The creator of the Mutiversal Phasing Device that powers the base, her understanding of science is on a whole other level. 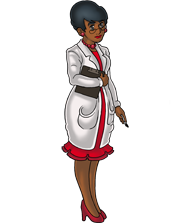 While she seems responsible and straight-laced, her ethics are somewhat questionable, that question being “are they even a thing?” The Scientist appears in most cutscenes with the General, but she also appears in the base’s universe selection screen. The Fey is a being of pure magic from a race that has traversed the expanses of all universes for millennia. 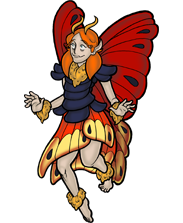 Mysterious and impatient with mortals, the Fey assists in finding and summoning heroes from other dimensions to aid the PANIC base. 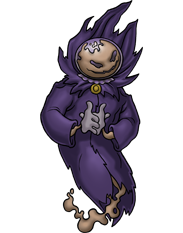 An ancient sentient gas that can’t say anything without it sounding creepy, the Collector offers trades of special items for bounties posted in his shop. Who knows why he wants seven clown scalps, but his weird obsessions are your payday. 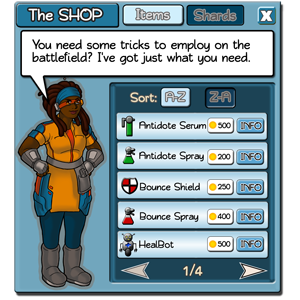 A brilliant inventor from a superhero dimension, the Gadgeteer designs and supplies the team with items that can be used during combat. She's pretty mellow, helpful, and incredibly confident in her skills. 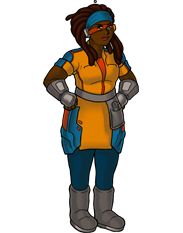 As with most of the primary cast, she occasionally appears in cutscenes, usually tending to one of the many mechanical heroes of PANIC base. 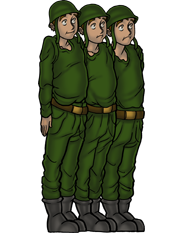 The Kevins are the clone soldiers in charge of various tasks at PANIC base. They get killed a lot. Despite their frequent doom, they are most often upbeat. 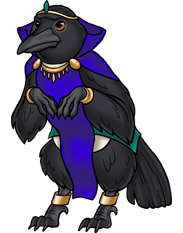 The Kevins are representatives of the base in cutscenes and sometimes appear in combat. The big bad of the game! King Sha’art has somehow amassed a huge army made up of soldiers from all over the Multiverse. He taunts our heroes at every opportunity while simultaneously demonstrating just how comically inept his plans are. It’s almost if he’s wielding powers he has no idea how to control properly. Hmm… plot point? Probably. 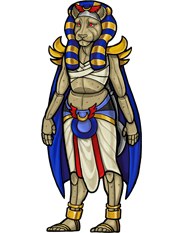 Legendary guardian of her dimension – which has been thrown into chaos by the minions of King Sha’art – Amunet-Ana is an ancient being of great power, Wielder of the powers of the Hidden Sun, crafted from magic and technology both. She is as graceful in battle as she is socially awkward and often politely bewildered (which is a lot). 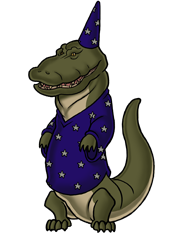 An alligator that someone has dressed in a wizard outfit for some reason. Perhaps some demented swamp wizard decided that you could give an alligator a chicken and feed them for a day or teach an alligator to conjure chickens and feed them for a lifetime. We can’t confirm, because MagiGator doesn’t talk. But what MagiGator can do is turn its enemies into chickens, which is also its favorite food. 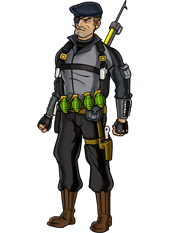 A super-spy and general man of action, Slick is always prepared for anything that the mission can throw at him. Once thought lost by an early test of the base’s phasing technology, Slick has fought his way back to his home universe and is ready to join the fight. You can’t spell “Danger” without Anger! 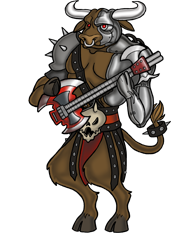 Slick’s skills are mostly geared toward massive damage and counters. 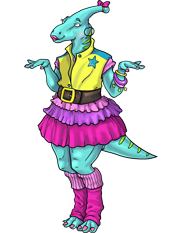 Cupcake is not only from a universe where dinosaurs never went extinct, she’s also the biggest pop star on her world. Using songs about love and friendship, Cupcake charms her enemies over to her side. Her B-Side “Multiverse People” is currently tearing up the charts in several dimensions. 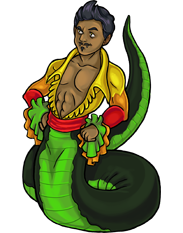 A sensual snake-man whose dancing is hypnotic and whose poison is deadly as his charm. Mambanaga LOVES THE DANCE. He also loves life. And people. Mambanaga loves a lot of things and also loves showing how he loves things. He is danger… and passion! 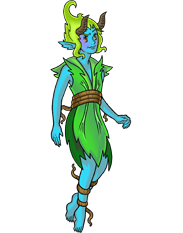 A neurotic fairy healer with a serious fear of bottles and blonde kids in green tunics. Savi just wants to help, and she does so with powerful fairy dust that can close up any wound. Some say Savi has a dark side to her personality, so it’s best to stay on her good side. From a dimension where every concept is given physical form, Apathy is the literal embodiment of the term. Feels “Meh” about most things, but joined up in the fight against King Sha’art and his armies because she had nothing better to do. It is unknown what she’s always looking at on her phone, but it’s pretty easy to guess how she feels about it. 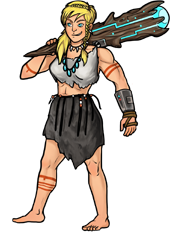 Named for the first thing her mother could think of when she was born, Baby is the daughter of a cavewoman and a time-traveling scientist. To further enhance her amazing strength and ferocity, Baby's father gifted her with a club capable of generating a "power field" when Baby lets out her warcry. Her language may seem simple, but English isn’t exactly the native tongue of a cavewoman, now is it? I bet you feel sheepish NOW, huh? 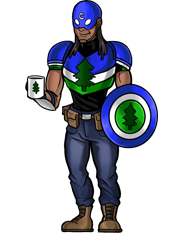 A hero from the country of Cascadia, the Captain fights for equality, the environment, and the right to just, you know, chill with a microbrew after work. His constant caffeinated blood gives him unlimited energy and an intensity that people are naturally drawn to, and his upbeat politeness and enthusiasm makes everyone eager to follow him, even if they aren’t the biggest fans of super-long nature walks and vegan baking. 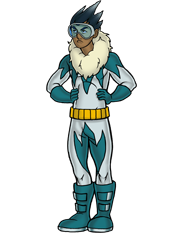 Though his powers are undoubtedly impressive, Cold Snap’s attitude is as frosty as the ice he wields. The short-tempered superhero has always had a chip on his shoulder due to a naturally-prickly personality… and the fact that he always wanted FIRE POWERS instead. Do yourself a favor and never tell him he looks cool. 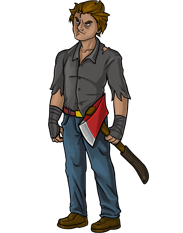 A seemingly-normal human with a serious axe to grind, Getz comes from an apocalyptic dimension where the dead walk. Doesn’t do well with jokes, but seems really super great with that axe. Well, great as in destroying things in very unpleasant ways, I mean. Lug is everyone's punching bag, and it's just fine with that. 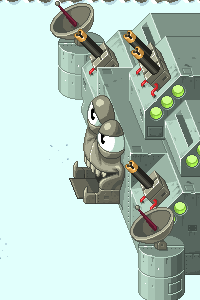 It's hard to tell if Lug's naturally a bit loopy or if all those hits have rattled its mind... Perhaps Lug's perpetual train of thought has made it transcend pain or the concept is alien in the pocket dimension it hails from. Either way, if someone loves hugs, or maybe just being hit in the face, it’s Lug! 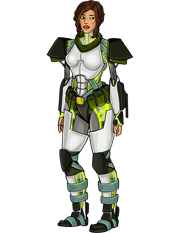 Pangari would like to assure you she is human, and not an extremely advanced military android created in a factory. Pangari insists that her strange-looking eyes are a human genetic defect and not mechanical scopes that assist her shooting. 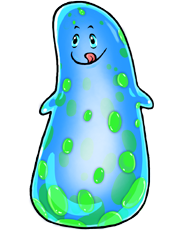 Please do not spill water on Pangari; she's allergic. 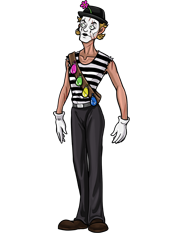 A mime from the "clown" dimension - where once mimes and clowns co-existed. Then the Clown Nation attacked, and destroyed most of the mimes... until a single mime turned his back on his people and learned to use the clown's greatest weapons against them - props, and his own miming skills, weaponized. …That’s Pitre here, in case you hadn’t guessed. TRAGIC BACKSTORY! 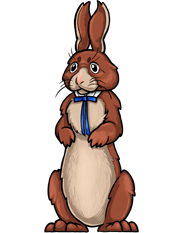 Rabbit claims he is a pooka, a legendary trickster from Irish myth. He also claims he’s the ambassador of jellybeans and a proud grandma of seventeen. Rabbit cannot be trusted, but his luck is undeniable. Also, you should probably watch your wallet around him, because… HEY! Where did mine go?! A phonomancer extreme, maker and muse both, a combo DJ/MC attuned to the rhythm of the stars, Remix is the Emissary and inheritor of the Great Cosmic Beat to which all the beings in the multiverse dance. Sha'art's war is risking turning the very rhythm of the Universe into the equivalent of a bad piano recital, so she's descended to dispense justice. 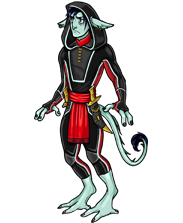 Disciple of the Universal Church of Order, Staterius brings justice to things that are out of balance with his Blades of Order, which he uses with steely reserve and a grim sense of purpose. Also kind of an overdramatic spaz prone to monologuing and reacting comically when getting surprised. But hey, he is still super good at beating up bad guys! 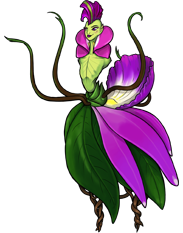 From a dimension where plants evolved sentience, mobility, and a snappy sense of humor, this diva of mobile vegetation came to heal hurts, whip butts, and be fantastic. 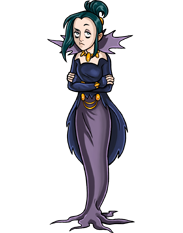 Vinka Bloom is thorny to her enemies as she is sweet to her friends, and she never does anything in half-measures.